Sarah Levy reports on a tentative agreement for Portland teachers that wins on most of the union’s main demands–thanks to teachers’ thorough preparations for a strike. WITH LESS than 48 hours to go before what would have been the first strike in the history of the Portland Association of Teachers (PAT), the union’s bargaining team reached a tentative agreement and suspended the walkout that was set to begin on February 20. The tentative agreement will now be put to a ratification vote by the rank and file. The deal came after a marathon 23-hour-long bargaining session, but the critical factor in putting pressure on the school district–after 10 months of negotiations without much movement from school officials–was the union’s thorough preparation for a strike, which culminated in a near-unanimous vote on February 5 to authorize the walkout. In a February 24 report about the agreement to the union’s contract organizing committee, PAT officials said that they had forced the school board to concede on a number of fronts, including probably the most prominent demand of all–hiring additional teachers to allow for a meaningful reduction in class sizes. Under the tentative deal, with the addition of 150 FTEs, the number of teachers in the district will grow by around 5 percent. Fifty FTEs will go to high schools, 70 to pre-K through 8th grade, and 30 to special education. As a result, average class sizes will be reduced, giving students more attention from teachers, who, in turn, will see their workload reduced. The district was also forced to drop its demand to remove an overall cap on class sizes from the contract. In another win for the union, elementary school teachers will see their planning time increase from 185 minutes to 260 minutes per week. The agreement also requires the school board, over the next two years, to re-establish student load levels back to where they stood in 2010-11, should the district choose to maintain the current class schedule. The district gets the option to add two school days, but must pay teachers at the per diem rate. SCHOOL OFFICIALS also agreed to pay raises of 2.3 percent in each of the next three years, retroactive to July 2013. This is a modest amount, but better than the pay freezes and pay cuts seen in many public-sector labor agreements. The proposed deal also mandates that the school district continue to pay 93 percent of health care costs. The PAT also pushed back the district’s effort to delete contract language covering teacher evaluations and the use of student test scores in evaluations. The proposed contract contains language that bars “the use of student performance on standardized tests as a basis for involuntary transfers, layoffs, placement on the salary schedule, and/or disciplinary language,” union officials said. In winning this provision, the PAT scored an advance on an issue where many local teachers unions have retreated. The union also withstood district attempts to restrict teachers’ right to file grievances over procedures. The parties believe that a well-rounded public education should prepare every student for college, career and full participation as an active and informed community member, regardless of race, class, ethnicity, gender, sexual orientation or zip code. The parties also recognize that a well-rounded public education includes, but is not limited to, giving students a strong start, and providing students with an enriched, diverse and comprehensive whole-child curriculum. The PAT did, however, make a concession on two fronts. The union also agreed to limit the internal transfer process to one round of internal hiring, compared with two rounds of internal hiring in the past. This means that teachers with less experience can potentially bypass teachers with more experience, and probationary teachers could potentially bypass non-probationary teachers for jobs. But external applicants still cannot jump over teachers currently working in Portland Public Schools (PPS). These are setbacks, but they are relatively minor compared to other teachers contracts negotiated recently, where unions have abandoned long-held opposition to merit pay and attacks on tenure. By preparing to strike, the PAT won a contract that holds the line on the issues teachers say they care most about. BUT EVEN with teachers relieved by the prospect of avoiding a walkout, many see this contract as only a first step in a much longer fight for the schools Portland students deserve. [But] we must consider the hard-won victory of this contract as a single battle in a larger war to restore our classrooms to conditions that make it possible for teachers to do their jobs…Enjoy this moment but remember that the fight is NOT over; there remains so much left to do to achieve the schools that we can truly say provide a world-class teaching and learning experience. The gains made in this contract must be seen in the context of the last two decades, during which Portland teachers have made a series of concessions, supposedly to stave off even worse measures, like the firing of teachers. Since 2003, when teachers worked for 10 days without pay in order provide students with a full school year and avoid a strike, they continued to give up cost-of-living increases and delayed paid step increases. They endured cuts to their pensions and increases in the amount they contribute to health insurance. Over time, PAT members went from being some of the highest-paid teachers in the metropolitan area to some of the lowest–all while suffering an increase in workload. To top it off, when the current round of bargaining began last April, teachers had just agreed to delay their step increases by six months to save $2.5 million. This, along with the district putting in an additional $2.5 million into the budget and the city’s injection of $5 million, covered a $10 million shortfall. GOING INTO contract negotiations, teachers framed their demands around the idea that teachers’ working conditions are students’ learning conditions. The PAT’s initial contract proposal at the start of negotiations began with a preamble titled “The Schools Portland Students Deserve”–modeled on a similar document put out by the Chicago Teachers Union in the run-up to its September 2012 showdown with the city. The union used this framework to show how what they were demanding in their union contract–such as class size and workload (the total number of students one teacher sees) relief; wraparound services like counseling and other professional student support; and full funding for programs such as art, music and physical education–wasn’t just for the good of teachers, but for students and the community as a whole. The union has also argued that smaller class sizes would disproportionately benefit low-income, minority and other students who are the most in need–contrary to the line of the Oregonian newspaper that greedy teachers would only hurt the neediest students with their contract demands. Teachers also drew attention to the district’s skewed spending priorities, making it clear that the problem was not a lack of funds. One stark example: PPS’s decision topay union-busting consultant Yvonne Deckard some $15,000 per month–a total cost of $360,000 in taxpayer dollars over two years if she completes her no-bid contract, which runs through June. At the same time, the school district claimed it couldn’t find the money to maintain teachers or programs in art or physical education, or even libraries in many schools. We are heartened by the [additional revenue forecast]…for PPS next school year, thus providing even more resources to reduce class sizes. Our expectation for our reinvestment budget was to make sure school districts had the resources to hire additional teachers and other educational professionals in order to decrease class sizes and improve the learning environment for all students. Another influential statement came from Rev. Chuck Curry , who wrote an “Open Letter from Portland Religious Leaders Concerning the Possibility of a Portland Teacher Strike” that was co-signed by 20 religious leaders of different faiths across the city. BUT MOST impressive in the teachers’ strike preparations was the outpouring of grassroots and neighborhood-based support from parents and community members who, inspired by the teachers, were determined to put all the pieces together in order to insure the success of a strike. 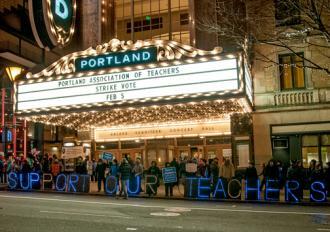 In the weeks following the February 5 strike vote, hundreds of community members were recruited from among thousands of signers of petitions circulated by the Portland Teachers Solidarity Campaign (PTSC) and among Jobs with Justice activists. They were put to work spreading the word about options for parents in case of a strike and pooling local resources for child care and food distribution in every cluster. PAT supporters could be seen outside nearly all of the district’s 80 schools, handing out thousands of leaflets, window signs and buttons. “Support Teachers” lawn signs were strategically targeted to surround school board members’ homes, and to line major streets. In the last few weeks, churches, unions and community centers began to offer strike-day child care. Meanwhile, the Portland Student Union (PdxSU) continued to plan and mobilize student support for teachers, spreading the message loud and clear that if “They strike, we strike, too!” Students had planned a march for the first day of the strike and were helping to coordinate baby-sitting and other strike resources where needed. Together, the community organizing and students’ support for their teachers helped to counter the district’s attempts to weaken the union, especially in the last few weeks. When the district tried to say that a strike would only hurt the students, students walked out for their teachers, and churches pledged to provide child care. When the district and mainstream media began claiming that a strike would hurt minorities and low-income families the most, these communities came together to coordinate child care in their neighborhoods and mobilize for district-sponsored English Language Learner parent forums to help spread the truth in multiple languages. Further countering the district’s attempt to divide the community, the local chapter of the NAACP, the N/NE Coalition of Neighbors and the Black-led Portland Parent Union all came out with statements of support for the PAT. Now, rather than winding down their organizing, teachers, parents and community activists are eager to maintain the current momentum and newfound community engagement. Discussions are on about possible next steps in a larger struggle to reclaim public education. As we return to “regular life” and find ourselves buried in work, please keep the fire of activism burning. Remember how much further we still have to go to reach our ultimate goals. Achieving a school environment that is just survivable is not nearly enough. So recharge while we regroup, and prepare yourself for the next battle to win back our schools! This entry was posted on March 1, 2014 by ClassroomStruggle in Uncategorized.